It started sometime last year. 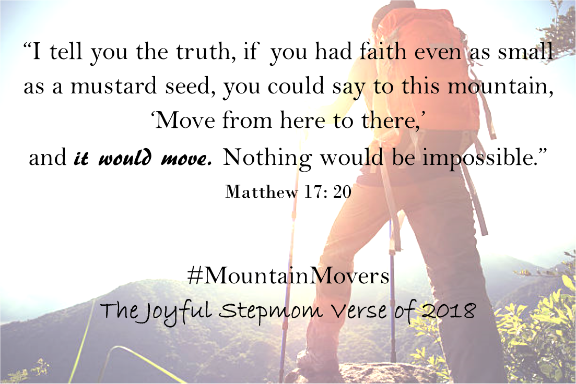 One of our Ministry Team leaders began to call us Mountain Movers. Then a member used the phrase as well. We had seen so much heartache among our friends...and in return, the stepmoms had prayed. And God had moved the mountains. Have you ever seen a mustard seed? It's tiny! I encourage you to walk down the spice aisle at the grocery store and take a look at the bottle of mustard seeds. You'll be amazed at how small they are! When court looms over us, when the finances seem impossible, when horrible things happen to our children, Jesus speaks to us. He says, "Stepmom, if you can have just a little faith in me, faith even just the size of that mustard seed in your cupboard, we will move these mountains together." That is the focus of The Joyful Stepmom in 2018. We want to remember the answered prayers and mountains already moved in front of us. And we want to keep pressing in together, dedicated to lifting each other and our families up in prayer. We are the Mountain Movers.